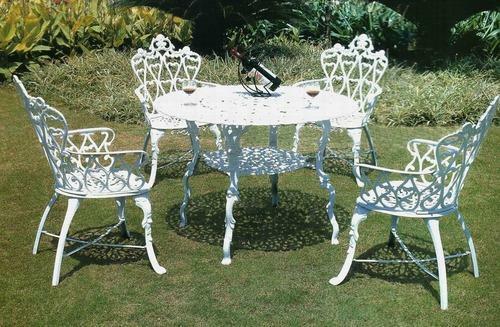 We hold expertise in offering our clients a wide gamut of high quality Cast Aluminum Furniture. This range is broadly utilized across diverse residential and commercial places for enhancing the decor of surroundings. Our range is intricately designed using high grade approved material and advanced technology in synchronization to standards. Furthermore, the entire range is strictly checked on several parameters to ensure that flawless range is delivered at clients' premises. Ferrous Craft is the most promising Manufacturer, Exporter, Wholesaler and Retailer firm founded in the year 2009 to change the scenario about outdoor living by presenting the most beautiful quality Garden Benches and Furniture. Over the years, we have gained huge repute in catering a wide assortment of quality products, which includes aesthetically designed Outdoor Benches, Outdoor Furniture and Outdoor Umbrellas. Our unwavering attention to quality reflects in our offered product range that is gaining huge acclamation for its light weight construction, flawless finish, unique designs, quick installation and long lasting performance. We pay relentless and careful attention to details to win trust of a huge client base from residential and hospitality sectors. Further, we have been emerged as the most competitive entity on the basis of advanced infrastructural set up that underpins our efforts to be the best. We leverage prevailing techniques to design and develop functional and highly comfortable furniture. Owing to the rich expertise of our established product designers, we have become the trusted entity for best quality furniture speaking elegance and luxury. Further, the rich support of recognized vendor base equips us to practice innovative usage of diverse materials to present unique furniture for our patrons from across the country and at our exporting countries of Europe, USA, and UAE.